Edinburgh’s Heriot-Watt University is conducting tests to see whether slab track technology used around the world is suitable for the construction of high-speed railways in the UK. The university said it believes the testing is the first of its kind in the UK. Eight sections of slab track supplied by German manufacturer Max Bögl are being used to conduct trials at the university’s Geo-pavement and Railway Accelerated Fatigue Testing (GRAFT) facility – one of only two such test facilities in the UK. The GRAFT facility can mimic the speed and dynamic loads of a high-speed train and simulate wear and tear equivalent to years of regular passenger service. The research will focus on developing two “novel embankment replacement systems”, which could potentially cut the cost of construction and improve track performance. 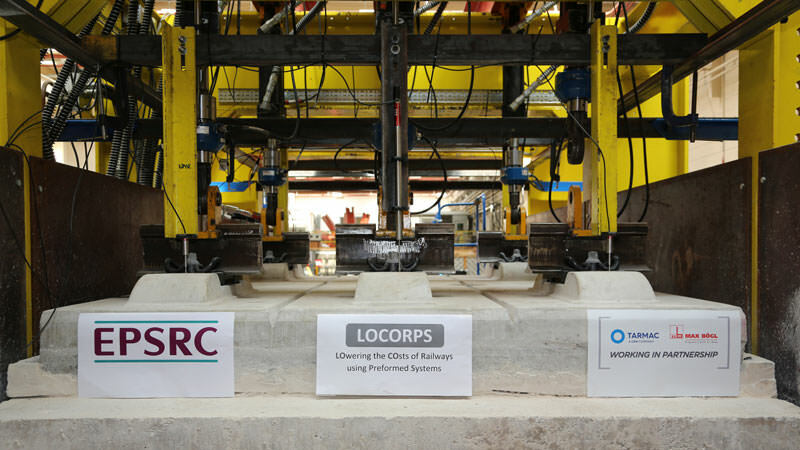 Heriot-Watt University, which is working alongside the University of Leeds, has received funding from the Engineering and Physical Sciences Research Council (EPSRC) to conduct the Lowering the Costs of Railways using Preformed Systems (LOCORPS) project. Other project partners include Network Rail, Laing O’Rourke, Atkins and Tarmac. Professor Omar Laghrouche, director of the Institute for Infrastructure and Environment at Heriot-Watt University, said: “We’re looking at differential track settlement, which is a serious problem in modern-day railway engineering, with considerable cost and time implications.